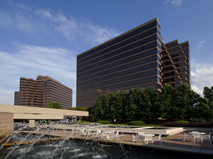 Northpark is comprised of three office buildings. Various amenities at the property are located in 400 and 500 Northpark as more specifically noted in the Amenities section of this manual. Exit 400 Northpark on the third floor Garden Rooftop. Follow the covered walkway to the pedestrian bridge that crosses over Peachtree-Dunwoody Road and ends on the parking deck of 500 Northpark. Enter the vestibule and walk up the circular staircase and follow the hallway to the foodcourt. From the 3rd floor garden food court, walk through the seating area toward the monument signage, on the North side (toward the hair salon) and take a left at the monument sign, following the overhead signage to 400 Northpark. Go down the circular staircase, and exit into the covered pedestrian bridge that will lead you to the 400 Northpark rooftop. Once on the rooftop, the Garden area can be accessed through the doors on the right. The tower and conference center are through the doors on your right. Proceed to the 3rd floor from the building elevators. Follow signage to cross the bridge into 500 Northpark. From there, follow the directions to 400 Northpark from 500 Northpark. Northpark is ADA compliant and provides wheelchair accessibility. Please contact Northpark Management for details on accessible routes. Northpark customers, clients and visitors can access the Sandy Springs Marta station directly from the Northpark property via a pedestrian tunnel and covered walkway system. Visit www.itsmarta.com for railway maps and bus routes.